Every September is Library Card Sign-up Month! This year’s Honorary Chair is none other than Snoopy! Take this time to remind parents that the best school supply they can get their child is a library card that allows them access to print and online collections as well as online resources like Brainfuse which offers free, online tutoring to students. 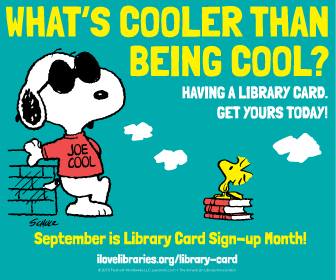 Get cool images for your FB page, proclamations, programming & outreach ideas here! While your in the programming mode, this is also the perfect time to begin preparing for the 20th anniversary of Día in April. Día or El día de los niños/El día de los libros (Children’s Day/Book Day) is a celebration of children, families and reading that emphasizes the importance of literacy for children of all linguistic and cultural backgrounds. On April 30, 2016 we’re encouraging all New Mexican children to read to someone special: a pare nt, a grandparent, a friend, or even a beloved pet. 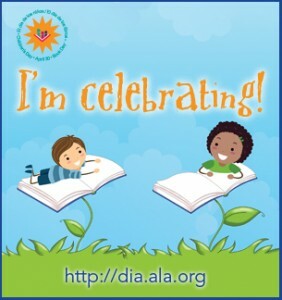 The best way to celebrate Día is to check out your favorite book from the library, find that someone special to read to, and start reading! More ideas to come on Día from the State Library — if you’re curious, read up on the background of this wonderful event here.